John Hanson…the first Lutheran President? Just for election day, here’s a reposting from May 2010. Has a Lutheran ever served as president? The answer is more controversial than you might think. Prior to the Constitution, which established our system of government, there was a document called the Articles of Confederation. Although not a perfect document, it was the first official document that “united” the states. As with any political document, it took some time to hammer out the details. In 1781, after 4 years of negotiating, the last state to holdout- Maryland- ratified the document. The signer, a Lutheran named John Hanson, was then asked to serve as the president of the now official congress. Here’s where the controversy begins. 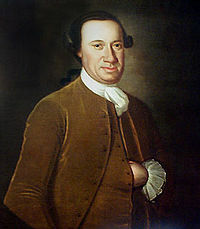 Because Hanson served as the first president of Congress, some claim this makes John Hanson-not George Washington- the first President of the United States. The truth, however, lies in the paper Hanson ratified on behalf of his home state. Since the Articles of Confederation did not officially establish an executive branch, it was impossible for Hanson to be the president of the young nation. Still, Hanson’s story has taken on a legend of its own. Some sources claim that much of the foundations and traditions of our country— from designing the Great Seal to establishing Thanksgiving as the fourth Thursday of November—were set by Hanson. The truth is that Hanson’s position as president of Congress was more clerical than executive in nature. He served his one year term competently but without much flair. And so it is that the United States has yet to see a Lutheran president. Hubert H. Humphrey, who served as Vice President under Lyndon Johnson from 1965-1970, is the closest a Lutheran has come to being president.